The Golf Hall of Fame of BC is inducting new members on October 18, 2017 at Point Grey Golf & Country Club. Prior to the induction ceremony, the BC Golf House is releasing a series of biographies of all of the inductees. The name Pat Fletcher is remembered each year when the Canadian Open Championship is conducted. The media quizzes each Canadian Touring Professional if he will be the one to break the jinx. 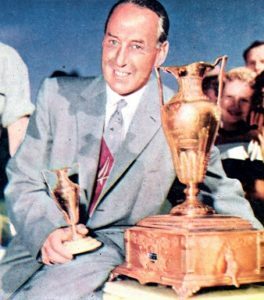 In 1954 Pat Fletcher became the first Canadian professional golfer to win the Canadian Open since 1914 when Karl Keffer won the nation’s highest golfing honour. Now Fletcher is recognized as the last Canadian professional golfer to accomplish the feat. Born in Clacton-on-Sea, England on June 18, 1916, and accompanied his brother Alfred (b1914) and his mother Edythe (Edith) aboard the SS Melita to Canada. Edith probably married Ernest Alfred Fletcher about 1913. The 1901 and 1911 England censuses indicate Edith lived in wealthy surroundings. The family lived in Newcastle upon Tyne, Northumberland. Edith had four brothers and four sisters. The1901 and 1910 cenuses show her father worked as a Marine Consulting Engineer and the family had three servants. For an unknown reason at present Edith moved the family to Canada in 1920. Upon their arrival in Quebec City on June 12th, 1920 the family travelled to Victoria, BC to reside with Edith’s sister-in-law. Research indicates Edith resided in Victoria until her death on August 18th, 1959. She worked mainly as a housekeeper and as a bookkeeper. The Victoria City directories after 1922 list Edith as a widow. During the 1930s, Pat attended Oak Bay School participating in several sports, but golf became his passion. Every spare moment he spent at the Victoria Golf Course working in Phil Taylor’s Golf Shop. Caddying for the Oak Bay members dominated his spare time after school. He played in the Victoria Golf Club Caddie Championship and the Victoria City Junior and Caddy Championships. As he grew older, Pat apprenticed under Phil to become a clubmaker/golf professional. In 1936 he became a golf professional working as an apprentice at Jasper, Mayfair, and Edmonton golf clubs. Pat played competitively in the Western professional championships, the National CPGA, and the Canadian Opens. From 1945 to 1960, Stan Leonard definitely ranked as the #1 golf professional in Canada, winning CPGA titles and pro titles. For this reason, Pat’s competitive record probably lacks more successes. He finished second three times during his tenure in Alberta. Upon his move to the head professional position at the Saskatoon G&CC he placed first or second in the Saskatchewan Open. In 1956 he moved to the Royal Montreal GC to assume the premiere head professional job in Canada. He retired to his adopted hometown, Victoria BC in 1975. As the first round closed, everyone thought Pat’s 65 had locked up the best score of the day. But news surfaced Bob Rosburg could catch him and finish even lower. At the end, Rosburg led with a 63. After the second round, Pat had overtaken Rosburg with Gordie Brydson, the Mississauga pro, lurking four shots back. After the third day, Brydson managed to lead the field with 207, Fletcher at 209 and Rosburg at 210. In the final round, Pat appeared to be out of the tournament with a 39 on the front nine. “I was ready to jump into the river” But anything can happen in golf. For some reason Brydson lost his composure on the eighth and things got progressively worse. He scored bogey, double bogey and triple bogey. With renewed hope Pat took off. Shooting 32 on the back nine to win. “With the exception of Brydson there could have been no more popular winner than Pat Fletcher. This quiet, unassuming, and rather shy man carried his title with dignity.” He returned to the Open long after he retired hoping to present the trophy to another Canadian professional. Want to attend the Induction Ceremony and Dinner? Tickets are available through our website.